-Popcorn! We’re big on snacks around here, so in addition to the ever-present bowl of apples (local) and clementines (decidedly not), I’ve found popcorn to be a reliable no-sugar option. Whereas we used to buy a box of microwave bag popcorn at the supermarket fortified with about four-thousand mysterious ingredients, now we buy popcorn kernels by the pound from Ryan- a vendor at the Dorset Farmer’s market. We pop it with a little canola oil, add olive oil or butter and salt and voila! I never used to be a huge popcorn fan, but now I’m a new convert. -Hummus!! The kids are big fans of this chick pea and tahini dip which never tastes right when we buy it from the store- I make it myself in the Cuisinart from a can of chick peas, some garlic, olive oil, salt, lemon juice and tahini. Paired with corn chips or crackers it goes so fast around here that I have yet to put any away in the fridge for later. -Oatmeal made with milk and topped with fruit has become a breakfast staple. Sure, it’s a pain having to turn the stove on and actually cook before I’m even fully awake, but I’m getting used to it. In the last month we’ve tried oatmeal with fresh cut-up strawberries, blueberries and frozen organic raspberries on top. Raspberries seem to lend the best juicy sweetness to the oatmeal. 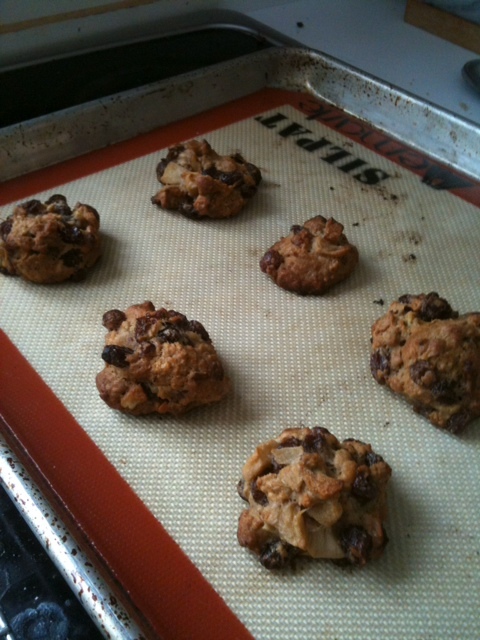 -Raisin cookies! In my mostly-fruitless search for some genuine no-sugar dessert recipes online, I found this recipe for cookies made with raisins and apples. You have to work a little harder than with most cookie recipes- the fruit gets cooked before being added to the dry ingredients, and the mixed batter must then chill in the fridge overnight… but it really does result in a cookie! Without sugar! Okay, this might be the banana pudding effect at work again; I probably wouldn’t try to stack these up against Nestle Tollhouse or anything, but for a no-sugar dessert these are sweet and chewy and definitely cookies. I wasn’t sure how I’d make a whole year without cookies! –Anything to not feel deprived. One pivotal thing I’ve learned over the last month is that so much of our battle is psychological: we’re often fine eating at home, but when we are surrounded by friends at school or skating or movie night at the school, all having snacks or treats we aren’t, suddenly things get exponentially harder. Therefore, when we’re at skating I make it a point to let the kids buy an apple or banana from the snack bar. No, the fruit isn’t organic, in fact it doesn’t even look very good, and yes, it is ridiculously expensive ($1.50 for an apple, anyone?) but when I suggested to my six-year-old that we could bring better fruit from home she objected immediately. “It’s more fun to buy it here, Mommy.” Okay. We aren’t buying the soft pretzels or hot cocoa or french fries or gatorade that everyone else is- but at least we can buy something from the concession stand too. And sometimes that can make all the difference. You are currently reading A Year of No Sugar: Post 19 at Eve O. Schaub.